Spanish-language Scrabble is arguably the second biggest scene for the word game. Organized club and tournament play falls under the oversight of FISE (Federación Internacional de Scrabble en Español). There are a number of major national and international tournaments throughout the year, including an annual world championship. FISE uses a complex, Scrabble-specialized ELO system to rank its players. Besides the classic head-to-head version of the game, Duplicate Scrabble is very popular among Spanish players, complete with its own world championship. In addition to playing in clubs, many avid players practice online at www.redeletras.com, a website which supports the annual world championship through direct sponsorship . The official word list for organized play is based on Diccionario Real Academia Española, an extensive, definitive, unabridged dictionary. While there is no published bound book with all the acceptable words (presumably because of its enormity), there is an online adjudicator for Spanish Scrabble words. bonus plays ("bingo" in English="Scrabble" in Spanish). There are as yet few software resources for word study, but some word lists are posted here, where you'll also find a link to Mike Wolfberg's What word study program adapted for Spanish. Here is where you can get a free version of DupMaster, a software program used for playing duplicate Scrabble. While Spanish-language players still do not have deluxe boards available to them, protiles in Spanish are now available for purchase here. To give you a taste for competitive Spanish Scrabble, here is my tournament report from the 14th World Spanish Scrabble Championship. The Spanish Scrabble tiles shown above are Protiles. Purchase @ www.Protiles.net. Also available: Hindi tiles and Latin tiles. Contact us for custom tiles. 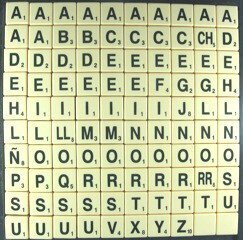 I manufacture round and fold-up SCRABBLE boards (in lightweight acrylic) in 8 languages; Spanish being one of them. My website is www.adjudicator3000.com and I can be reached at gene@adjudicator3000.com Please drop me a line if you have any questions (In English please, since I don't speak Spanish) I look forward to hearing from you. championship held the previous year.